With Jameis Winston suspended, Ryan Fitzpatrick throws for 417 yards and four touchdowns in season-opening victory. With the Saints out of timeouts, the Bucs run out the clock to hang on for a 48-40 win. Huge! Ryan Fitzpatrick scrambles for a first down on 3rd-and-11 with 2 minutes remaining. Brees finds Alvin Kamara in the end zone with 3:31 remaining. Ted Ginn catches the two-point conversion pass to pull the Saints to within 48-40. Brees pass to Michael Thomas moves the ball deep into Bucs territory. DeSean Jackson has a concussion and is out for the rest of the game. Catanzaro misses from 44 yards, and the Saints quickly move to midfield. HUGE play on third down. Fitz to Jackson. But Jackson injured on play. Fitzpatrick floats a pass to DeSean Jackson for a first down on 3rd-and-3. Jackson down on the play but walks off under his own power. I don't think the #Bucs blow this lead, but this game is not over-over. Bucs lead 48-32 with 8:54 left. Kamara walks in for the touchdown, then picks up the two-point conversion. Bucs 48, Saints 32. Michael Thomas pulls in a Brees pass at the goal line. Hargreaves doubtful to return with a shoulder injury. Brees connects with Benjamin Watson at the 7 on 4th-and-4 to keep the Saints' drive alive. Justin Evans back in the game, but now Vernon Hargreaves headed to the locker room after injuring himself breaking up a pass. Pass interference penalty moves ball inside Bucs 20. Justin Evans shaken up after being penalized for hit on a defenseless player (Alvin Kamara). The 48 points ties a franchise record in a game. Nice! Fitzpatrick hits DeSean Jackson on the money for a 36-yard touchdown. Bucs now up, 48-24. Ryan Fitzpatrick and the @buccaneers CANNOT be stopped right now. ANOTHER TD pass to @DeSeanJackson11! 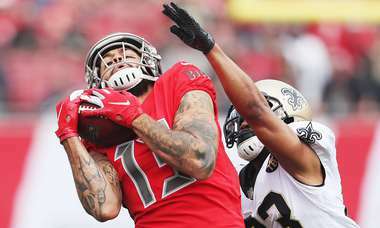 Pass interference penalty on Ken Crawley sets up Bucs at Saints 36. Given the Jameis situation, this could be Bucs best opener since 1997, their coming-out party against San Francisco that set stage for the return to the playoffs. Okay, this is getting ridiculous. The Bucs struggled throwing the deep ball last season. Ryan Fitzpatrick just proved he can do it. Fitzmagic struck again on a perfect 50-yard bomb to MIke Evans, who doesn’t get behind the defense a ton but was money on that play. The defense is doing a good job of tackling in the second half. 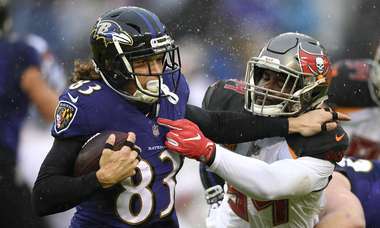 And even thought they’re giving up yards, they got their second turnover when Kwon Alexander forced a fumble when he hit Michael Thomas and Ryan Smith recovered at midfield. Not for nothing, but how good is it to have no kicking drama. Good debut by Chandler Catanzaro today. Through three quarters, #Bucs have 419 yards of total offense. Three really big splash plays today for #Bucs defense. A third-down sack. and two fumble recoveries, including one taken back for a TD. End of 3rd Q, Bucs lead the Saints 41-24. Ryan Smith recovers a Michael Thomas fumble after a hit from behind from Kwon Alexander. Mike Evans beats Marshawn Lattimore off the ball, and Fitzpatrick hits him in stride for a 50-yard touchdown. Bucs now lead 41-24. A big hit by Justin Evans on Michael Thomas on 3rd-and-8 forces another New Orleans punt. Ryan Fitzpatrick overthrows a wide open Chris Godwin down the right sideline, and the Bucs punt for the first time in the game. Brees completion to Austin Carr short of a first down, forcing the Saints to punt. Gerald McCoy and Kwon Alexander drop Alvin Kamara behind the line of scrimmage, forcing Saints into 3rd-and-13. Chandler Catanzaro converts a 36-yard field goal, extending the Bucs lead to 34-24. Back shoulder throw for Freddie Martino incomplete. Ryan Jensen slapped with unsportsmanlike conduct penalty after the play, costing the Bucs 15 yards. Second-down pass for Alan Cross out of bounds. Mike Evans leaves with an injury. Peyton Barber stopped for no gain on 1st-and-goal from the Saints 3. Ryan Fitzpatrick hits wide-open Mike Evans over the middle, moving the ball inside the 5. Roughing the passer penalty on David Onyemata sets up the Bus at the Saints 36. Bucs are doing almost everything right on offense. Handling the noise. Good pass protection. Running the football. Couldn’t ask for much more. Ryan Fitzpatrick with his second TD, a back shoulder pass to Chris Godwin. The Bucs can’t get much pressure on Brees. He was sacked once in the second quarter by Vinny Curry. Outside of that, the new D-line has not been a factor in the run or pass game. Saints can do what they want. Alvin Kamara is a beast. He’s equally dangerous as a runner or receiver. He breaks ankles. You can’t tackle him with one man. The Bucs need to swarm to the ball more. Ryan Fitzpatrick has a PERFECT passer rating at halftime. Adam Humphries takes a reception to the Saints 10, but the play comes back due to a block in the back. Michael Thomas wide open in the middle of the end zone, and Drew Brees finds him for a 6-yard touchdown on 3rd-and-1. Saints trim Bucs lead to 31-24 with 0:55 remaining. Kamara takes a short pass, slips a couple of tackles and gets to the Bucs 15 with 1:47 left. Alvin Kamara up the middle for a first down inside the 40 as we reach the 2-minute warning. Saints back on the move, crossing midfield on a Thomas reception. Michael Thomas takes it to the house, but inexplicably ruled down after the catch even though no Buc touched him. Yikes. #Bucs caught a break right there. Thomas never touched, but was ruled down. Justin Evans with a scoop and score after Vernon Hargreaves forced a Mike Gillislee fumble. Bucs lead, 31-17. There was never a question about how good #Bucs skilled players are. But there were questions about Fitzpatrick and the offensive line. Both have been outstanding so far today. Back shoulder throw from Fitzpatrick to Chris Godwin results in a touchdown and 24-17 Bucs lead. Fitzpatrick takes off up the middle, setting up 3rd-and-6 from the Saints 9. Fitzpatrick hits O.J. Howard and Mike Evans on consecutive passes, moving the ball to the Saints 25. Mike Evans with a catch on 3rd-and-2, giving the Bucs a first down. Vinny Curry get the Bucs' first sack of the season. Chandler Catanzaro good from 33 yards, tying the game at 17-17 with just over 11 minutes to play. Fitzpatrick appears to hit Cameron Brate, who takes the ball inside the New Orleans 5. But pass called incomplete. Fitzpatrick throws incomplete, but offsetting penalties nullify the play. Barber tackled behind the line of scrimmage, bringing up 3rd-and-7 from Saints 15. Fitzpatrick finds tight end O.J. Howard on the outside on 3rd-and-4 for 35 yards to the Saints 18. Good news for #bucs. Jackson back in the game. Chris Godwin recovers his own fumble after 16-yard reception. Ted Ginn beats Carlton Davis to the right corner of the end zone and pulls in a Bree pass for a 28-yard TD. Saints lead, 17-14. Bucs QB Ryan Fitzpatrick played lights out. 4 of 5 passing for 102 yard and the deep shot to DeSean Jackson for a TD. He also ran for a score. The Bucs WRs showed up. In addition to Jackson, Godwin had a diving catch and Evans made a leaping grab. The young defensive backs will struggle. Carlton Davis got beat a few times and was taken out in the start of the second quarter. Brees hits Michael Thomas for 35 yards, moving the ball inside the Bucs 30. Ted Ginn with a 9-yard reception to the Saints 35. Ryan Fitzpatrick is having a day. Diving catch by Chris Godwin and leaping grab by Mike Evans sets up his 3-yard TD run. Bucs 14, Saints 10. Bam! Ryan Fitzpatrick runs through Marcus Williams for 3 yards and a go-ahead Bucs TD. Bucs 14, Saints 10. Back-to-back receptions by Chris Godwin and Mike Evans moves the ball inside the Saints 5. Barber up the middle for 12 yards and another first down. Peyton Barber finds an open running lane and goes 23 yards to midfield. Was good plan to take DJax shot early. Quieted crowd. Will Lutz’s 36-yard field goal restores the Saints' lead. Saints 10, Bucs 7. Brees' throw just past the fingertips of Kamara in the left corner of the end zone. Kwon Alexander brings down Michael Thomas, setting up 3rd-and-3 from the 17. Alvin Kamara keeps the chains moving with a 10-yard run to the 24. Benjamin Watson beats Chris Conte for a catch inside the Bucs 35. Drew Brees connects with Ted Ginn for 11 yards and another first down. Michael Thomas beats Vernon Hargreaves for a catch and a Saints first down. Wide open. Well-designed play. Todd Monken's debut as an NFL player caller produces a touchdown on his first drive. Huge coverage bust by the Saints with Jackson in the slot. Wow! Fitzpatrick hits a wide-open Jackson for 58 yards and a Bucs touchdown. Bucs 7, Saints 7. Peyton Barber picks up 3 yards and a first down. Ryan Fitzpatrick finds DeSean Jackson along the left sideline for 7 yards. Shaun Wilson returns the kickoff 29 yards to the Bucs 32. Kamara up the middle for 5 yards and a New Orleans touchdown. Saints lead, 7-0, with 11:41 left in the first. Kamara ducks his head and moves a pile to the 5, setting up 3rd and 2. Brees finds Michael Thomas for 14 yards to the Bucs 13. Alvin Kamara beats Kwon Alexander across the middle for 35 yards to the Bucs 32. Can these Bucs go where no Fitzpatrick team has gone before? Is tight end O.J. Howard the Bucs' biggest ‘treat’? The Bucs used a second-round pick on Southern Cal running back Ronald Jones, hoping he would bring explosive plays in the running and passing game. But Jones won't be given a chance to play in today's season opener against the Saints. The Bucs rookie is among the list of inactive players. Peyton Barber, Jacquizz Rodgers and undrafted rookie Shaun Wilson will be the running backs for Tampa Bay. Wilson also serves as the Bucs' kickoff returner while Jones is not a major contributor on special teams. Read Rick Stroud’s full story here. So here we are. Game 1 without Jameis Winston. Against the Saints. In New Orleans. Las Vegas has the Buccaneers as 10-point underdogs. They don’t stand a chance Sunday. They’re going to eat another L.
We’re hearing there’s only one way for the Bucs to win. They have to run the ball. Drain the clock. Shorten the game. Keep Drew Brees and the Saints offense off the field. Ask Ryan Fitzpatrick to be a game manager. Protect the ball. Throw only when necessary. If they do that, maybe, just maybe — no, not maybe — they will lose. Read Thomas Bassinger’s full story here. Can Bucs go where no Fitzpatrick team has gone before? 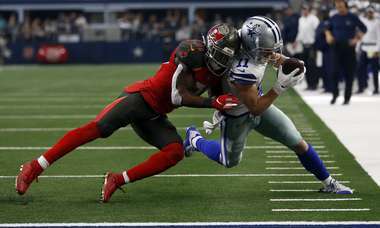 TAMPA – How big is the challenge facing Ryan Fitzpatrick, beginning with Sunday’s game at New Orleans? Put simply, he's being asked to do something he has only done once in 13 NFL seasons. The 35-year-old Fitzpatrick, who has played for seven teams, has quarterbacked 23 road victories in his career. Only once did a victory come against a team that finished the season with a winning record. It happened in 2009 when the Bills beat the Jets 16-13 at MetLife Stadium. What’s more, Fitzpatrick didn’t even start that game, coming off the bench for Buffalo to beat the Jets' Mark Sanchez, who helped the cause by throwing five interceptions that day. Those Jets finished 9-7. 'The Bucs open their season Sunday in New Orleans. It's just one game. The result means no more or no less than any of the other 15 on the schedule. But here's the deal: this game is huge. For the psyche of a fragile franchise at a seemingly perpetual crossroad, this one game could set the tone for the rest of the season. And the Bucs go into it with more questions that answers, more doubts than certainties, more concerns than optimism. That’s why it feels like so much is riding on this one game. Read Tom Jones' full column here. TAMPA — It’s suddenly become a secret as to who will be calling plays for the Bucs at New Orleans today in the season opener: coach Dirk Koetter or offensive coordinator Todd Monken. Monken was told to do it in training camp and the preseason, and was successful. Through the first three preseason games (no starters played in the fourth), the Bucs averaged 28.6 points and 387 yards per game, ranking second in the league in both. The Bucs also got off to quick starts, outscoring opponents 46-23 in the first half. Quarterbacks Jameis Winston, Ryan Fitzpatrick and Ryan Griffin combined to pass for 938 yards and six touchdowns with no interceptions. Koetter will take the decision down to the wire today.